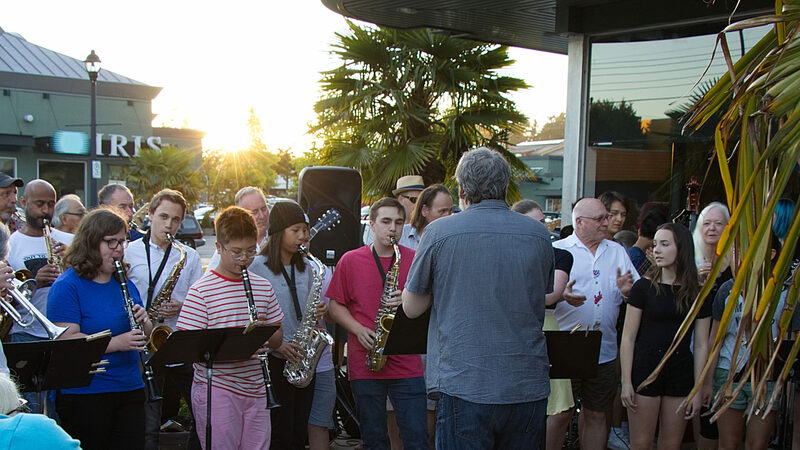 Welcome: The South Delta Jazz Festival is an annual week-long event featuring various concerts for the public plus a five -day workshop for students from beginning to adults interested in learning about or improving their jazz improv skills in a small combo setting. History: The South Delta Jazz Festival held its first season in July 2004. The program was initiated by the Delta Community Music School Society and founded by Delta Music School instructors Jared Burrows and Stephen Robb. The festival was created to give music students of a wide variety of ages and abilities an opportunity learn about jazz improvisation during an intensive one-week program. Other professional musicians from around the Vancouver area were invited to come and join us. The result was a unique opportunity for students to play and learn side by side with instructors and professional musicians in small ensemble settings. Today: Our festival is growing into a major community event for Delta. With the success of the Jazz Workshop over the past few years, it has now progressed to a full one-week Festival. The generosity of corporate sponsors and the support from the community has allowed the Jazz Workshop to expand and has enabled us to welcome more guest artists to instruct and perform during the festival. Sponsorship also means tuition levels for our workshop will remain affordable, and scholarships will be available to students.